Why going for a costly Fire Alarm system? Some of the Fire alarm systems cost more than Rs.2000. You can make an efficient Fire warning system for just Rs.20. It uses only a few components and is a very efficient Flame sensor. The Thermister based commercial Flame sensors have a drawback because, the alarm sounds only when the Thermister turns hot by the nearby flame. That means, the alarm sounds only after the room is full of fire. But this tiny circuit overrides that drawback. It uses a Photodiode as Fire sensor. It sounds the alarm even if the flame is far away . Interestingly, the spark of the first fire burst can activates the alarm. It can be installed in Home, Commercial shops etc. It will not activate in the ambient light of the room like that of Fluorescent light. 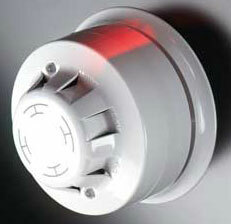 It sounds the alarm only when it detects a light similar to a flame, sunlight or incandescent bulb. It is battery operated and in the standby state the current consumption is as low as 5 mA. So Simple, Efficient, and Low cost. Build it. This is the simplest type of Fire Alarm. It beeps when it detects Fire. Too simple to make . You can make a simple Heat Monitor using only a few components. It can be attached to heat generating devices like Amplifier, Inverter and Computer. The sensor is an NTC Thermistor always monitor the heat in its vicinity and activates the alarm LED if the heat increases above the normal level. What happens when only a few pins of 555 is used? Still we can make circuits. Here ,is a simple Fire alarm based on IC555. The trigger pin2 is used to achieve the result in addition the VCC and Ground pins. 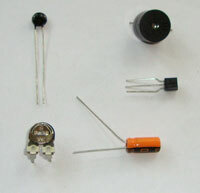 In this design, the IC555 act like a switch to give high output. When the temperature in the Room or a device exceeds the set limit, alarm sounds. Excess heat in electronic devices can damage the delicate CMOS components and it is necessary to monitor the temperature in these devices. 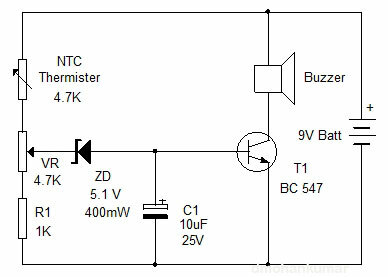 With this Five component circuit, you can monitor the temperature in the heat generating devices like CPU, Inverter, CD player, Amplifier etc. It gives a warning alarm, when the temperature inside the cabinet of the device exceeds the normal level. It uses an NTC Thermister as heat sensor. The circuit is too small enough to enclose inside the gadget. This is the circuit of a Heat sensor that beeps when it detects heat. It is an ideal add on circuit in heat generating devices like Inverter and Amplifier. The circuit uses a NTC Thermister as Heat sensor.